(*) Drink was initially made with dry vermouth (Noilly Prat), but in remaking it, blanc vermouth seemed to round out the edges better. Two Mondays ago, I thought about my tropical Martini riff, the Diamond Queen, and how a split base of white spirits, vermouth, and a touch of fruity element worked so well. 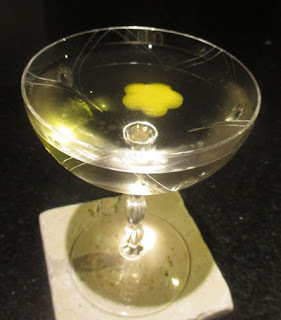 Moreover, I thought about the banana-tinged riff on the Manhattan, the Zemurray that I recently had, and I wondered if I could do a similar Martini with a hint of banana. Keeping the gin, dry vermouth, and orange bitters of the classic Martini, I substituted some of the gin with rhum agricole, and I added in a dash of crème de banana. While I liked the end result, it was a bit rough from the rhum agricole and I remade it later with better effect using blanc vermouth. For a name, I made this drink a tribute to Boston fruit seller Andrew Preston & Wellfleet ship captain Lorenzo Baker who teamed up in the 1870s to start importing bananas to Boston. This ventured soon morphed into the Boston Fruit Company that later merged with Zemurray's and other tropical fruit importing ventures to form the United Fruit Company that was later became Chiquita. In the glass, the Preston-Baker cocktail gave forth a lemon oil aroma with tropicals fruit in a grassy pineapple way. Next, a white wine sip led into juniper, grassy, and subtle banana flavors on the swallow. Stir with ice, strain, and garnish with a lemon twist. 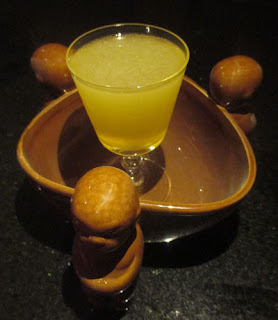 After the Moreaa Fizz, I decided to make the Chinese Cocktail in Louis Fouquet's 1896 Bariana which I was recently reminded of in my reading. 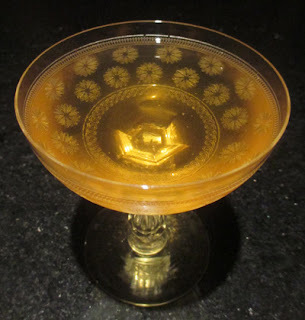 The book pointed out that the better known Chinese Cocktail was published by Franck Newman in his 1904 American-Bar book, and Newman's recipe was adopted by Robert Vermeire and Harry McElhone; I made the latter drink as it appeared in the 1935 Old Waldorf-Astoria Bar Book. Whereas the better known Chinese Cocktail has rum, Maraschino, curaçao, grenadine, and Angostura Bitters, this one split the spirit base with Cognac, swapped the Maraschino for the also nutty crème de noyaux, and opted for sugar instead of grenadine, but overall, the general feel of the two is similar. In the glass, the Chinese Cocktail came across almost tea like with fruit and tannin notes, so opting for a Chinese tea cup was surprising apt. On the nose, the lemon twist's oils joined Cognac and nutty noyaux aromas. Next, a dry cherry-like sip gave way to rum, brandy, and nutty apricot flavors on the swallow with a bitter clove and allspice finish. Shake once without ice and once with ice, strain into a Highball glass with 2-3 oz soda water, and garnish with an edible orchid and pineapple leaves (omit). While looking for the evening's drink two Sundays ago, my perusing of the BarNotes app uncovered an entry by Chad Austin of Bootlegger Tiki's take on a Ramos Gin Fizz. The Fizz was named the Moreaa Fizz after the Mo'orea Island in French Polynesia just northwest of Tahiti. Once prepared, the Moreaa Fizz gave forth a tropical-floral aroma from the passion fruit liqueur combining with the orange blossom water on the nose. Next, a creamy, carbonated citrus sip led into gin and tart passion fruit flavors on the swallow. 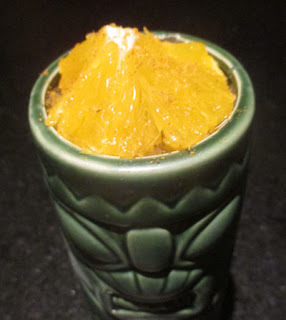 Shake with ice, strain into a Pilsner glass (Tiki mug), fill with crushed ice, and garnish with an orange slice, mint sprig (omit), and curry powder (Madras curry). Two Saturdays ago, there was a thread on the BG Reynold's Facebook group with someone inquiring about split spirits Bourbon and rum Tiki drinks. While I chimed in with my Fiji Mermaid, Arthur Boothe chimed in with his Worthy Adversary that he crafted at Bitters & Brass in Sanford, Florida. I met Arthur on an USBG-sponsored trip to the Patron distillery in 2016, and I was curious to taste what his drink making palate was like. Therefore, I replied on my walk home from work that I might make it that night. Surprisingly, the orange slice and curry aroma overtook that of the grassy rhum funk that was rather evident while straining the drink. Next, orange, lemon, and berry notes filled the sip, and the swallow showcased the grassy rhum funk meeting the whiskey with a berry-orange finish. It was interesting to see that both Arthur's and my drinks utilized lemon over lime juice and opted for grenadine as one of the sweeteners in our rum-Bourbon concoctions. With the Worthy Adversary's orange juice, the combination also reminded me a little of the Boston classic, the Ward Eight. For a drink two Thursday nights ago, I reached for William Schmidt's 1891 The Flowing Bowl and spotted the Gladstone. The recipe came across like a more complex Improved Whiskey Cocktail with additional flavors from Jamaican rum and kümmel. Once prepared, the Gladstone shared a whiskey, anise, and caraway bouquet to the nose. Next, malt and a light cherry flavor on the sip slid into rye, rum funk, nutty cherry, caraway, and other spice elements on the swallow. I was definitely pleased at how well the kümmel notes merged in with the bitters and absinthe of the Improved Whiskey Cocktail, and a touch of Jamaican rum funk rarely seems to hurt a flavor profile. Shake with ice, strain into a cocktail coupe, and garnish with a star anise pod (omit). One of the recipes that I had stored up from Tales of the Cocktail's 2017 Daiquiri Month was the Public Mutiny. The drink was crafted by Jason Sorbet of New Orlean's 21st Amendment in the same space previously occupied by the La Louisiane Hotel & Restaurant where my second favorite New Orleans cocktail was created, the Cocktail a la Louisiane. Between Daiquiri Month and actually making the drink, I acquired a bottle of Don Q Spiced Rum as a gift of the distributor when I heard Roberto Serralles of Don Q speak here in Boston, so I had all the ingredients to make this drink as intended. The Public Mutiny greeted the nose with allspice merging with darker aromas from the rum. Next, lime and caramel filled the sip, and the swallow proffered allspice, banana, vanilla, clove, and cinnamon flavors along with the rum base. Two Tuesdays ago, I decided to make a drink that I had been scheming up for two of my long time regulars who have followed me since my Russell House Tavern days to my new gig at River Bar. Since I had been on a Byrrh kick and River Bar has it in their fridge, I figured that I ought to begin to analyze the ingredient like I did for Swedish punsch a year ago. When I recalled how well it paired with mezcal in the Ask the Dust, I remembered that the tip came from Haus Alpenz. Therefore, I messaged my friend Jake Parrott of Haus Alpenz for advice on how to use this quinquina. He recommended a few things including St. Germain. And from the previous night's Italian Job, I nicked the Aperol ingredient along with a chocolate element from my own Ask the Dust by way of bitters. 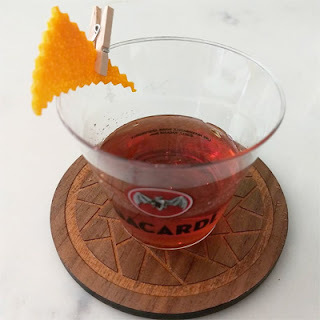 Since Aperol and St. Germain have played well in cocktails like the Dunniette and Part-Time Lover, I scrawled down the above recipe as a first pass. The combination worked rather well from a straw taste and my guests definitely seemed to approved. For a name, I later dubbed this one Eyes on the Table after a work by Spanish born surrealist artist Remedios Varo. Besides loving her work for quite a while, it was symbolically relevant given the French and Mexican ingredients since Varo fled to France during the Spanish Civil War and then to Mexico during the German Occupation of World War II. Stir with ice, strain into a cocktail glass, and garnish with the oils from an orange twist and with a dehydrated orange wheel (orange twist and its oils). Two Mondays ago, I decided to make one of the drinks that was published in Imbibe Magazine in late 2017 that was pushing me further towards buying a bottle of Byrrh. 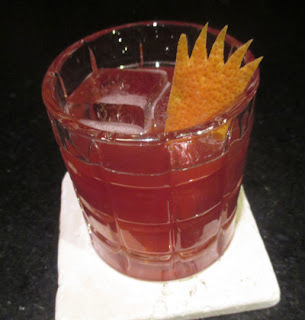 That recipe was the Italian Job crafted by Joseph Akhavan at Mabel in Paris, and it alluringly matched the quinquina with equal parts of funky Jamaican rum, Cocchi Americano, and Aperol. 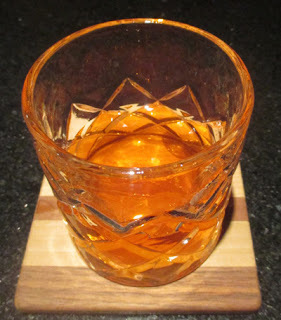 Once prepared, the Italian Job gave forth an orange aroma from the twist and Aperol along with rum funk on the nose. Next, grape and a grapefruit-orange note played well on the sip, and the swallow showcased the funky Smith & Cross colored by orange flavors with a dry, bitter quinine finish. Shake with ice, strain into a double old fashioned glass or Tiki mug, and fill with crushed ice. Garnish with a spent and scraped half lime shell containing a 151 proof rum-soaked crouton wick (El Dorado 151); ignite the rum. Two Sundays ago, I opted to make a recipe from Blair Reynolds that I had spotted in a 2010 Fine Cooking Magazine article written by Camper English called the Lift-Off! Blair crafted this drink at Portland's Thatch Tiki Bar before he purchased the spot and converted it into Hale Pele in 2012. Overall, the recipe reminded me of a Jet Pilot with orange juice in place of the grapefruit (besides leaving out the absinthe), so I was curious as to how this substitution would play out. Once prepared, the Lift-Off! gave forth a dark rum and cinnamon aroma. Next, lime and orange notes on the sip were darkened by the rum duo's caramel, and most of the rum flavor came through on the swallow that packed a bit of alcoholic heat to it along with cinnamon and clove spice from the liqueur and syrup. As the ice melted over time, the balance mellowed out into something rather pleasant to drink that showcased the cherry and other notes found in Lemon Hart rather than the burn; however, the flavor profile was a bit murky due to the orange juice dampening down the flavors in the mix (unlike the effect of the grapefruit which allowed the various components to sing out more). Shake with ice, strain into a cocktail coupe, and garnish with freshly grated nutmeg. Two Saturdays ago, I turned to a recipe that I had spotted on the BarNotes app for the 24th and a Half Century. The drink was crafted circa 2013 at Backbar in Somerville, MA, by Alex Homans as perhaps a riff on the tequila-containing 17th Century. Once prepared, the 24th and a Half Century gave forth a smoke, agave vegetal, and cinnamon bouquet to the nose. Next, grape and a richness from the syrup on the sip slid into smoke and agave flavors on the swallow with a quinine, cinnamon, and chocolate finish. The Gonzalez Cocktail a few nights before reminded me of the great combination of Maraschino-Punt e Mes that occurs in the Red Hook, and my mind drifted into thinking about a Daiquiri utilizing these two ingredients. The Daiquiri idea popped into my head since I have had ones that call for either of these two ingredients but not both. 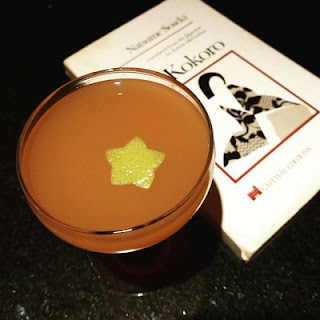 In terms of the Maraschino, the Trader Vic's Daiquiri from his 1946 book consists of Puerto Rican rum, Maraschino, sugar, and lime juice, and this reappeared in 1972 as the Kona Gold with Demerara rum and a touch of Herbsaint; the idea also can be found in the Hemingway and Rum Club Daiquiris. 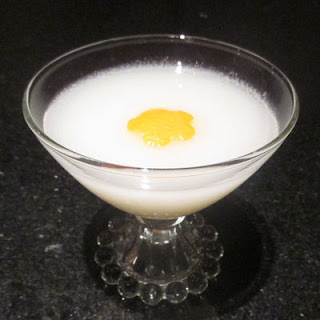 And with the Punt e Mes, I had success with it in a rhum agricole Daiquiri variation that I dubbed the Dakkar Grotto. So why not give the two of them a whirl in a single drink? 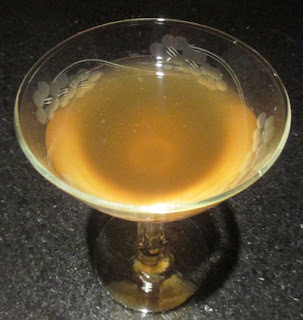 For a name, I made a nautical riff on the Redhook and named this one the Fishhook Daiquiri. For a rum, I considered both a funky Jamaican like Smith & Cross and a rhum agricole, but I ended up keeping it simple with Plantation Dark. In the glass, the dark rum greeted the nose along with lime and nutty cherry aromas. Next, crisp lime danced with darker notes from the grape and rum's caramel on the sip, and the swallow offered the elegant effect of dark rum being modulated by bitter-nutty flavors. 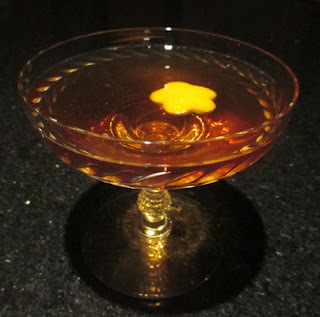 One of the recipes that I had spotted in Pioneers of Mixing at Elite Bars: 1903-1933 that called for Byrrh was the Carson which read much like a quinquina-for-vermouth version of the Brookyln Cocktail. Once stirred and strained two Thursdays ago, the Carson offered up lemon oil, nutty cherry, and hints of grape to the nose. Next, malt and grape came through on the sip, and the swallow presented rye with nutty cherry flavors flowing into orange ones; as the drink warmed up, the finish gained quinine and bitter orange notes. The end result reminded me a bit more of the Prospect Park than the Brooklyn, or perhaps it fell somewhere half way between the two. 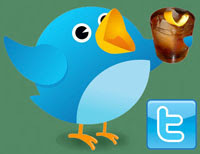 Shake with ice and strain into a double old fashioned glass with ice. Two Wednesdays ago, I turned to A Spot at the Bar for my evening's refreshment. There, I was lured in by the Golden Delicious that was attributed to NYC bartender Jim Kearns as an apple-for-whiskey Gold Rush variation. As I later sleuthed the web, I learned that Jim had created this recipe at the Pegu Club in Fall 2006 using Laird's 7 1/2 Year Apple Brandy. Since apples and honey are a natural pairing, I decided to give this one a whirl. The apple from the Calvados rang out rather strongly in the nose along with floral notes from the honey. Next, the honey continued on into the sip where it was balanced by crisp lemon notes, and the swallow offered apple finishing tart from the lemon. Two Tuesdays ago, I finally bought a bottle of Byrrh Quinquina for the home bar, for I had stored up enough recipes to make the purchase feel worth while. To kick off the bottle, I selected a recipe from Manhattan's Amor y Amargo that was published in a Punch Drinks article in 2017. I was able to sleuth out that the recipe was crafted there by Chris Elford circa 2012, and I when I tagged Chris on my Instagram post, he replied, "The Casualty Cocktail was the start to my love affair with Scotch + Monty + chocolate. Still a flavor combo I crave." Once prepared, the Casualty gave forth a bright orange oil aroma that countered the peat smoke and hints of grape and other fruit on the nose. Next, grape and malt mingled on the sip, and the swallow was a delightful Scotch, dark berry, and tangerine combination that ended with chocolate and woody bitterness on the finish. Two Mondays ago, I reached for the Death & Co. Cocktail Book for a nightcap to round out the evening. There, in the gin section, was Phil Ward's 2008 tribute to Death & Co. bartender Jessica Gonzalez who started as a cocktail waitress and progressed to become their first female bartender. 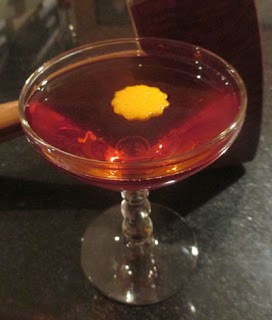 I had previously written about one of Jessica's drinks from that book called the Night Watch, and Phil's Gonzalez reminded me of a Martinez with Punt e Mes in place of the sweet vermouth. 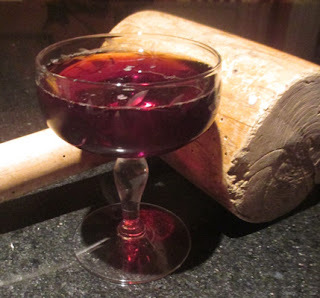 Once stirred and strained, the Gonzalez offered up a juniper and fruity note from the Maraschino and grape to the nose. Next, grape and hints of cherry filled with sip, and the swallow showcased gin merging into a bitter cherry and spice. This combination of Punt e Mes and Maraschino immediately reminded me of the flavor backbone of Eastern Standard's Prospect Park. Two Sundays ago, I ventured into Pioneers of Mixing at Elite Bars: 1903-1933 for an intriguing gem that I have somehow passed over through the years. There, I stumbled upon the Coats House that seemed like it would be an interesting Manhattan riff with perhaps a nutty sherry pairing the with the crème de noyaux. I probably skipped over this recipe when I interpreted French vermouth as dry vermouth, but with blanc vermouth as an option, I could use a drier sherry instead of opting for Pedro Ximenez as the sweetener. My search for what the drink could be named after yielded a historic English-style cottage in North Carolina that was built around 1860; while the house was important enough for a Wikipedia entry, was it important enough to have a drink named after it? In the glass, the Coats House proffered a nutty apricot bouquet to the nose. Next, malt and grape on the sip slid into rye, nutty, and floral flavors on the swallow with an orchard fruit and clove spice finish. Stir with ice, strain into a rocks glass with ice, and garnish with a grapefruit twist (an orange twist would work well here too). (*) A Jamaican rum like Wray & Nephew or perhaps even rhum agricole or Batavia Arrack would well work here. 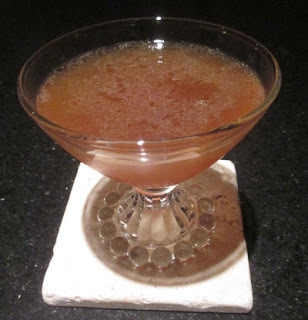 (**) Two parts grapefruit juice to one part cinnamon syrup; BG Reynolds syrup is a bit sweeter than the freshly made combination. On Easter Sunday, I was contemplating all of the drinks that get utilized for Easter including the Corpse Reviver, Rusty Nail, and the Zombie. 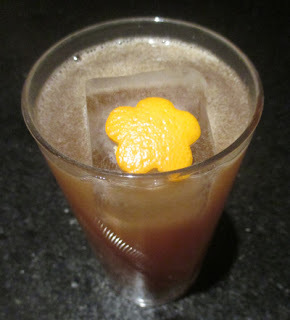 My mind began to play with the 1934 Zombie recipe, and I wondered if I could make a hybrid drink with a Rum Negroni. I began to parse the Zombie into three aspects: the rums, the crisp lime, and the modifiers. What if I were to remove the lime and replace it with Campari, and make each component around a third of the drink's build? 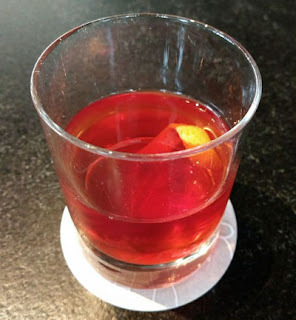 For a name, I thought about how Count Camillo Negroni was a cowboy in America before he returned to Italy to create the gin legend, and perhaps an undead Count Negroni could return on horseback; therefore, I dubbed this one The Count Rides Again. It is neither Zombie nor Negroni, but a monster composed of parts of each of them. 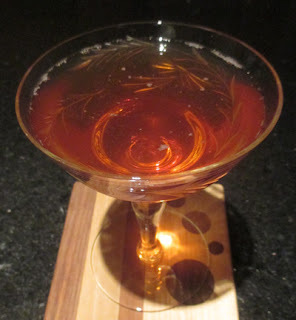 Indeed, the Don's Mix, falernum, grenadine, bitters, and absinthe combination of the Zombie has many of the fruity, spiced, and herbal qualities found in the Negroni's sweet vermouth. The twist and the Don's Mix seemed to dominate the drink's aroma with grapefruit and cinnamon notes. Next, a rich and citrussy sip led into funky rum, bitter orange, and cinnamon on the swallow in a rather complex combination akin to the layers of flavor in the classic Zombie. Given the bold notes here and reduced volumes of the the rums relative the Zombie, utilizing robustly flavored and overproof rums will help them from getting lost in the shuffle. Shake with ice, strain into a Collins glass with ice, top with soda water (2 oz), and garnish with an orange slice (orange twist). 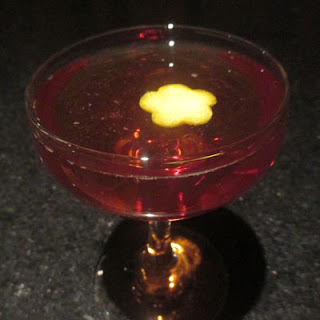 Two Fridays ago, I ventured back in Tales of the Cocktail history to their 2009 Stir Your Soul book where I spotted the Special Order 191 by Toby Maloney of the Violet Hour. Toby served this drink at one of the Tales events that year, and he named this Collins-like number after a September 1862 dispatch from Robert E. Lee's during the Civil War that was lost in transit. It was discovered by Union soldiers shortly after that, and it became a crucial part of Major General McClellan's plans to thwart the Confederates in the Maryland Campaign. Since I could not decipher the relation of the drink name's history to the build, I moved on to assembling this libation to see if the taste alone would satisfy my curiosity. The Special Order 191 in a glass began with an orange and elderflower bouquet that offered hints of Bourbon to the nose. Next, a carbonated lemon and fruity sip led into whiskey, elderflower, and grapefruit-orange flavors on the swallow. Stir with ice, strain into a double old fashioned glass with a large ice cube, and garnish with grapefruit oil from a twist. I was in a rum mood two Thursdays ago, so I selected the rum edition of the 2012 The Cocktail Hour booklet series. The Rum Old Fashioned of sorts called the Patent Pending stood out as a curiosity with Jamaican rum paired with Batavia Arrack and sweetened with Aperol and light touches of two classic Tiki syrups. The Patent Pending originated at the Teardrop Lounge where it was crafted by bartender Brian Gilbert, and I was able to find a reference to this drink as early as 2010 in an interview with BG Reynolds Syrups creator, Blair Reynolds, where he was asked what was his favorite cocktail using his products. He replied, "Brian over at Teardrop Lounge made up a wonderful drink called the Patent Pending, though it could just as easily been called 'Blair Candy,' since it contains pretty much everything I like." The Patent Pending began with grapefruit oil aromas that brightened the complex funk from the Jamaican rum coupled with the Indonesian spirit, and later touches of cinnamon joined the nose. Next, the sip was rich from the sweeteners and shared a hint of caramel from the aged rum, and the swallow gave forth funky rum and grapefruit flavors with a cinnamon and bitter finish from the Aperol and Peruvian bitters. Two Wednesdays ago, I began perusing Pioneers of Mixing at Elite Bars: 1903-1933 for the evening's libation. There, I spied the Mountaineer, and it struck me as a Manhattan mashup with Trader Vic's Arawak if the sherry here was a sweet one. Once prepared, the Mountaineer gave forth a raisin and funk nose that led into a rich grape and caramel sip. 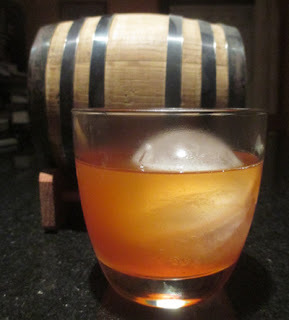 Next, rye, funky rum, and dark raisin flavors mingled on the swallow that ended with a winter-spiced finish. Stir with ice, strain into a rocks glass with ice, and garnish with a grapefruit twist. 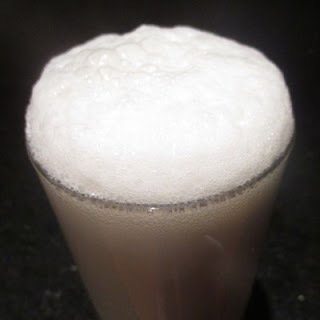 Two Tuesdays ago, I decided to make a drink that I had spotted on BarNotes posted by the app's creator, Peter Bodenheimer. The recipe was Maks Pazuniak's Black & Bluegrass crafted at Peter's brother's bar, The Cure in New Orleans. 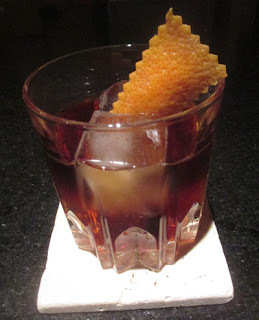 With rye, Averna, and Aperol in the mix, it pleasantly reminded me of something Aaron Butler improvised for me at Drink akin to a Black Manhattan with additional flavors from Aperol. Once prepared, the Black & Bluegrass offered the nose grapefruit, orange, and dark caramel aromas. Next, the caramel from the Averna continued on into the sip, and it was followed by rye and bitter-herbal orange flavors on the swallow with a clove finish. Two Mondays ago, I was invited to attend a class on rum aging held by Juan Coronado of Bacardi at the Blossom Bar in Brookline. Throughout the day, we were treated to Cuban-style drinks that ranged from classics like a Bacardi Superior-based Daiquiri a la 1898 to more recent ones like the Mulata Daisy crafted for a recent Bacardi Legacy competition. Indeed, beginning the session with a Daiquiri Time Out made for a great start to my Monday. One of the classics that I had never tried was called the Presidente. 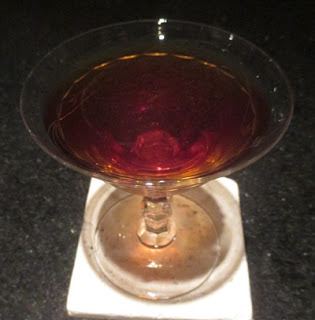 Well, I have had another version of the El Presidente before -- both with the older interpretation of dry vermouth and the more recent one with blanc vermouth along with rum, curaçao, and grenadine. Both Presidentes were crafted by Constantino Ribalaigua Vert at the Floradita Bar in Havana, but this one took the form of a Rum-hattan. In his Cocktails: Bar La Florida books, the editions up to 1937 have the Presidente as a Chambery vermouth (and the 1932 Sloppy Joe's Cocktail Book has it as a Noilly Prat Dry Vermouth recipe) but the 1939 one has it as "Ama Vermouth" which was here interpreted as sweet vermouth (the Sloppy Joe's Cocktail Book also included the Ama Vermouth brand but with no descriptor). Chill with crushed ice, strain, and serve with cherries and a peel of an orange. 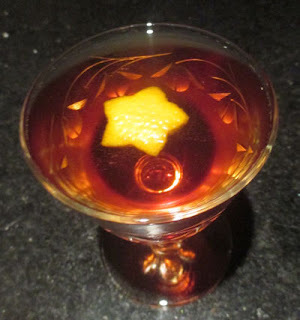 The drink that Blossom Bar's Ran Duan made utilized a bit less vermouth and substituted Martini & Rossi Sweet Vermouth, added bitters, and skipped the cherries. Once prepared, the Presidente offered orange oil notes that complemented the curaçao's orange aroma. Next, a dark grape sip yielded to a rum, grape, and orange swallow that ended with an orange, clove, and allspice finish. Overall, this Presidente was much different in a Manhattan direction (as opposed to a Martini one) than the better known El Presidente recipe. On the walk home from work two Sunday nights ago, I began thinking about ingredient combinations that might work well together in a novel recipe. One that popped into my head was the orgeat-Maraschino duo that worked great in Tiki drinks like the Gold Cup but also worked in more standard drinks like the Genever Daisy. The idea of a mashup made me think about simple classics that utilized these two sweeteners; the two that called out were the Japanese Cocktail from Jerry Thomas' 1862 How to Mix Drinks and the Fancy Free from Crosby Gaige's 1941 Cocktail Guide and Ladies' Companion. With both drinks being spirit, sweetener, and bitters in an Old Fashioned style, I merged the two and utilized the Fancy Free's Angostura in place of the Japanese Cocktail's Boker's Bitters. For a name, I looked to Japan and thought about famous neighborhoods. One that stuck out was the Golden Gai region that is jam packed with tiny bars holding sometimes fewer than 10 seats each. In including the Fancy Free theme, I took an alliterative route and dubbed it Gallivanting in Golden Gai. In the glass, the lemon oil brightened the Cognac and nutty nose. Next, a creamy sip led into first Bourbon mingling with brandy and second a hybrid of Maraschino and orgeat generating an earthy cherry flavor on the swallow followed by an orange and spice finish. Stir with ice and strain into a cocktail glass; I added an orange twist to the recipe. For a nightcap two Saturdays ago, I returned to Pioneers of Mixing at Elite Bars: 1903-1933 where I uncovered the Caldwell. The Caldwell's split rye and applejack base in a Manhattan-like format reminded me of more modern drinks that I have had like P.D.T. 's Harvest Moon, so I was willing to give it a go. I probably skipped over this recipe when I previously interpreted the call for French vermouth as the dry variety, but with blanc vermouth, this combination had a more tempting balance. In the glass, the Caldwell greeted the nose with whiskey and bright orange oil notes that trailed away to show apple aromas. Next, sweet white grape and malt on the sip slid into rye and apple on the swallow with an allspice finish that had alternating whiskey and apple flavors lingering on the end. Stir with ice, strain into a double old fashioned glass rinsed with equal parts of absinthe (Pernod Absinthe) and mezcal (Sombra), and garnish with orange oils from a twist. After getting home from my bar shift two Friday nights ago, I selected from my Food & Wine: Cocktails collection the 2011 edition. That book contained an agave section curated by Phil Ward while he was running Manhattan's Mayahuel bar, and one of the recipes that he presented was the Barrio Viejo, a tequila Sazerac riff that included mezcal along with the absinthe in the rinse. Once constructed, the Barrio Viejo showcased an orange, smoke, and anise bouquet to the nose. 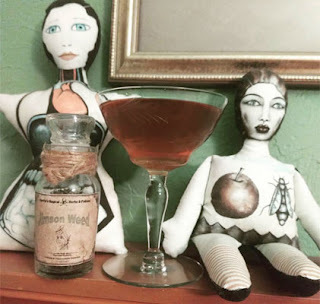 Next, the cane syrup donated a richness to the sip, and the swallow gave forth agave flavors accented by clove, anise, and cinnamon spice notes. 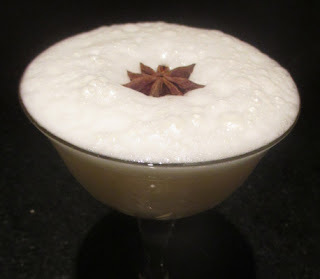 Shake once without and once with ice, strain into a cocktail glass, and garnish with a floated star anise pod. After dinner two Wednesdays ago, I ventured into Frank Caiafa's 2016 Waldorf-Astoria Bar Book for something to wrap up the evening. There, I landed on the X Marks the Spot that seemed like a delightfully tropical egg white Sour. In the glass, the X Marks the Spot presented a banana and star anise aroma that preceded a creamy lime and orange sip. 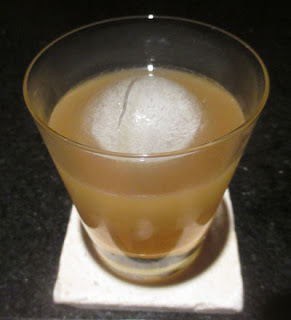 Next, rum, banana, ginger, and allspice flavors pleasantly mingled on the swallow to round out the drink. 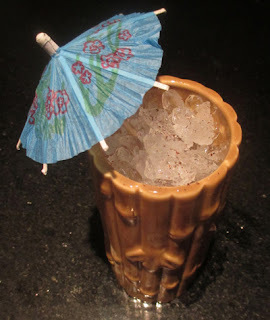 Shake with ice, strain into a Tiki mug, fill with crushed ice, and garnish with Tiki intent (freshly grated nutmeg and a paper umbrella). 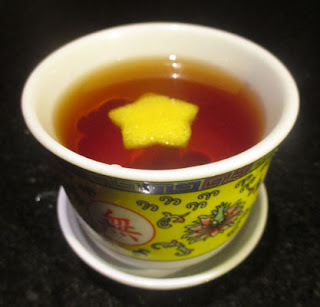 (*) A strong 5 minute steep of green tea, remove tea leaves, mix in an equal part of sugar, and stir to dissolve. On the Reddit's Cocktails forum, one of the moderators, Hebug, wrote me inquiring if I would like to help him with an event akin to Mixology Monday but more adapted to the Reddit structure than the blogging one. As a successor of Mixology Monday, I ended up dubbing this project Tipple Tuesday; it was a name that I had reserved in case Paul Clarke was unwilling to open up Mixology Monday after he had shelved the project himself. In the end, Paul opened up an account for me on the Mixology Monday site, and I was able to run it for a few dozen more events under that aegis. 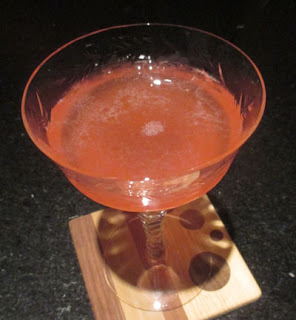 For a starter event for Tipple Tuesday (click here), I opted an experiment utilizing the Mr. Potato Head technique where ingredients are swapped out for others (of similar style) while maintaining the drink skeleton intact. 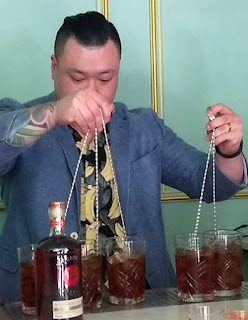 This technique is one that Phil Ward praises, and it has generated him drinks like the Oaxacan Old Fashioned and the Final Ward. As a Mr. Potato Head body for this event, I selected the Test Pilot which has yielded me success in the past as a tinkering model with such drinks as the Fiji Mermaid and the Navigator. For the major change, I honed in on the two sweeteners, triple sec and falernum, and swapped them for apricot liqueur and green tea syrup for I wanted to keep one fruit and one spice element (spice as in the classic punch theory where tea fulfilled that aspect). Perhaps this combination was inspired by the Kobayashi Maru, but there were many drink thoughts going through my head around the same time. Since apricot pairs elegantly with rhum agricole such as in the Rhum Agricot and Abricot Vieux, I changed the lesser rum to rhum agricole and moved the original's light Puerto Rican rum to the larger volume one (replacing dark Jamaican rum). For a name, I focused in on the tea element and named this after one of the famous 19th century British tea clipper ships, the Fiery Cross. Once prepared, the Fiery Cross greeted the nose with aromas of nutmeg and orchard fruit from the apricot and lime combination. Next, the lime and orchard fruit notes continued on into the sip, and the swallow offered the rum flavors and grassy tea merging with apricot with the absinthe's anise popping in on the finish. Stir with ice, strain into a cocktail coupe, and top with dry Champagne (1 1/2 oz Willm Blanc de Blancs). Two Tuesdays ago, I reached for the Death & Co. Cocktail Book and uncovered Phil Ward's 2008 Calva Dorsa Royal. Calva Dorsa meaning "bald summit" refers to the chart indicator on 17th century maps for two cliff zones on the Norman coast that signified to sailors where the harbor was; sailors soon contracted this to Calvados, and later, the name stuck to the apple brandy produced in that region. For this drink, Phil Ward stuck to his template of spirit + liqueur + absinthe +/- a wine element that he utilized in the Cooper Union and Joy Division with the Calva Dorsa Royal like the Cooper Union opting for St. Germain as the sweetener. True to the Royal aspect of the name, this one was lightened with sparkling wine. The Calva Dorsa Royal presented an apple and anise bouquet to the nose. Next, a carbonated white wine sip gave hints of apple notes, and the swallow followed up with the rest of the apple flavors along with elderflower and absinthe's anise. Overall, the whole combination came across much like a sparkling hard cider. Shake (stir) with ice and strain into a cocktail glass; I added an orange twist. For a nightcap two Monday nights ago, I reached for Pioneers of Mixing at Elite Bars: 1903-1933 and spotted the Coronation in the gin section that differed from the Coronation Cocktail from the 1905 Hoffman House Bartender's Guide. The Martini with orgeat formula reminded me though of the Pioneers' Remembrance which also had absinthe in the mix. As for the name, two possible British coronations around the book's range include the 1902 crowning of Edward VII and the 1911 one with George V; the latter one was already captured in cocktail lore with the King George V so perhaps he was the more tipple-worthy one. The Coronation gave forth an orange, pine, and hints of almond nose that came across as almost tropical. Next, a creamy white grape sip slid into gin and nutty orgeat flavors on the swallow with a floral orange finish. Mix in a blender with ice and serve frappé in a champagne glass (shake with ice and strain into a cocktail coupe). In search of something refreshing two Sunday nights ago, I began flipping through Trader Vic's 1947 Bartender's Guide. What caught my thirst was the Cuban Cocktail #6 which was very different from the Cuban Cocktail from a few nights ago but closer to the Cuban Cocktail #2 given the apricot. More than either of those two namesake drinks, it appeared like a Periodista with grenadine subbing in for the orange liqueur. Moreover, the combination of spirit, citrus, apricot liqueur, and grenadine reminded me of the gin-based Bermudian also known as the Bermuda Rose or the Boston Cocktail (perhaps renamed as such in 1935 for the first edition of the Mr. Boston drink book). The Cuban Cocktail #6 shared an apricot and fruity bouquet that preceded a lime, berry, and hints of orchard fruit sip. 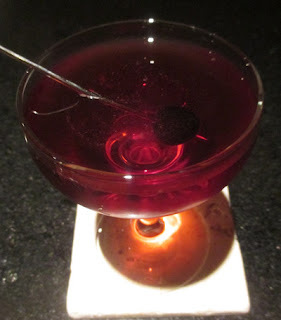 Next, the swallow began with rum and apricot flavors before leading into berry notes from the grenadine.